When the surface of the gum tissue becomes inflamed and diseased, the condition is known as gingivitis. The following picture shows gingivitis associated with bite problem. If allowed to continue, the surface gum inflammation can move into the deeper supporting structures of the bone and ligament and is known as periodontitis. Depending how severe the disease is, it is classified as slight, moderate or advanced. The most typical form of the disease tends to be slow, progressive and chronic. If not treated, it will lead to complete destruction of the supporting tissues, abscesses and, finally, loss of the tooth. The advanced level of disease has resulted in recession and loss of a central incisor in the picture below. 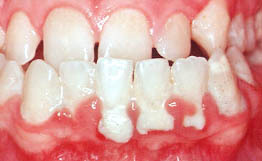 Although very rare, periodontitis may affect children. A form of the disease affecting teenagers known as Localized Aggressive Periodontitis and can affect the permanent first molar and incisor teeth. A rather severe form of periodontal disease known as Aggressive Periodontitis usually affects young adults aged 20 to 30 and will result in early tooth loss if untreated.